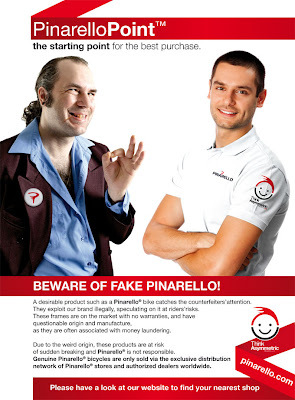 Back in September, 2010, Michele Bartoli signed an agreement with Prestigio (translates to Prestige) to create a line of Bartoli bicycles. The first result of this collaboration is the new Bartoli "Altair". 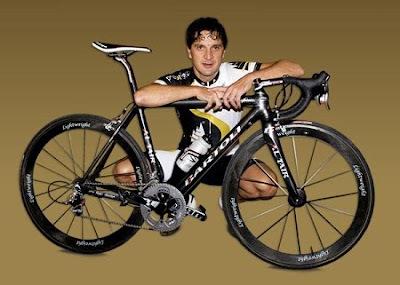 Of the Altair project Bartoli explains, "As a rider I was always meticulous, very attentive to detail. So, when Prestigio CEO Di Marco proposed this project I immediately realized that it could be an interesting path for me to take. In collaboration with the Prestigio engineers we have developed a really nice frame, I am particularly proud." 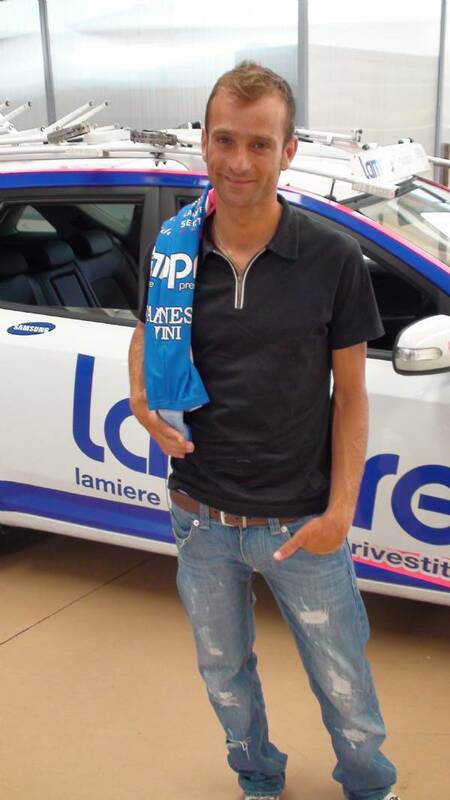 "I consider it a bit unique in cycling", said the former champion from Pisa. "It is a frame 100% made in Italy, using T-1000 carbon tubes finished with the technical details that allow for maximum stiffness, great stability and absolute reactivity in every riding situation. The name Altair was chosen because the meaning in Arabic is 'the flying eagle', and also because it is the name of the brightest star in the constellation Aquila." This article is in two parts: 1) the UCI announcement of the launch of the "UCI World Cycling Tour" (UWCT), and 2) the announcement by the Gran Fondo New York indicating that the event is a qualifier for the UWCT final to be held in Belgium. A new cycling tour for amateur riders that will ultimately crown age group World Champions is being launched by the UCI in 2011. The UCI World Cycling Tour (UWCT) is a series of UCI-sanctioned races that will be held all over the world. The UWCT will comprise a maximum of 15 qualifier events, leading to the UWCT Final, the former UCI Masters Road World Championships. The top 10% in each age group of the qualifier events will automatically have the right to compete in the UWCT Final and race for the coveted UCI rainbow jersey. The UCI’s Cycling for All, Masters and Sustainable Development Coordinator, Ms Andrea Marcellini Mendonça, explains the importance of this amateur tour: “If we look at cycling as a pyramid, professional racing is at the very top and occupies a very small portion. Everything that comes below this is the amateur side of the sport and involves impressive numbers of riders. These enthusiasts are part of the UCI family and it’s time for them to race for a World Champion title”. Another aim of this new initiative is to contribute to the international promotion of the UCI’s “Cycling for All” events. All races on the UWCT calendar must meet strict organisational and sporting criteria, and provide a certain touristic interest. In order to host the qualifier events of the UWCT, the UCI is currently receiving applications from regions willing to organise a high standard cycling event that will attract riders from all over the world. Gran Fondo New York is excited to be a qualifying race of the UCI World Cycling Tour (UWCT) for the 2011 UCI Amateur Cycling World Championship. UWCT is rewriting the history of amateur cycling. Athletes of all ages will gather at events across the globe to chase the dream of competing at the World Championship. As one of six qualifying events in 2011, Gran Fondo New York sends the top 10% of each Age Group to Belgium where the World Championship finale will take place on the famed roads of of the Belgian classic Liège-Bastogne-Liège. At Gran Fondo New York, the competition consists of four challenging climbs that will be timed and count towards UCI Amateur World Championship qualification. 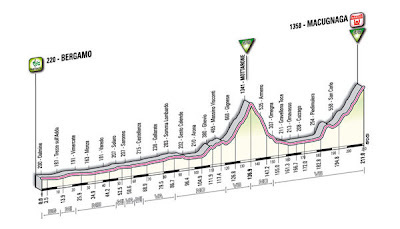 The four timed climbs are added together to determine a total time and the overall ranking. The top 10% of each Age Group will qualify for the 2011 UWCT World Championship in Belgium. Furthermore, the introduction of a Challenger Category gives an opportunity to showcase young talent in the ranks to become professional cyclists of the future. The World Championship final will be a city to city race in Belgium in early September. The race will start with a loop of 100 km (60 miles) over the monuments of Liège-Bastogne-Liège with Cote de Stoumont, Cote de Wanne, Cote de la Haute Levée, Cote du Rosier, Cote de la Vecquee, Cote de Macquisard and finally Cote de la Redoute. After the initial course, riders will do five local laps in Remouchamps-Aywaille. Each loop will include a steep 1 kilometer climb per lap (14k). The world's cyclists are getting excited about Gran Fondo New York. The event is drawing a strong local, national and very international field with athletes representing 31 countries. Lidia Fluhme, the race organizer, points out: "The competition for World Championship qualification and the great awards prizes will be fierce at Gran Fondo New York. We joined the UCI World Cycling Tour series because we strongly believe in the future of amateur racing. Triathlon and running have shown the importance of including amateurs in key events to ensure sustainability and growth." Prizes at GFNY are valued at more than $100,000. Winners of all categories will receive special winners' jerseys by Giordana. Podium finishers of all categories win fantastic prizes from event sponsors. 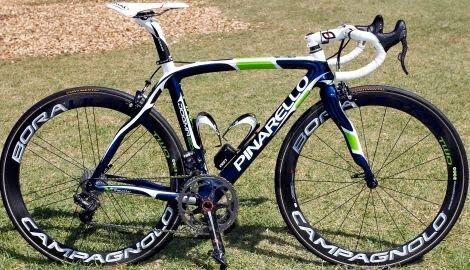 The King and Queen of Mountain will ride home on their new PINARELLO road bikes. Other prizes include MAVIC racing wheels, DIADORA shoes, LIMAR helmets and shades, SELLE SAN MARCO saddles and much, much more. Additionally, raffle prizes will be distributed throughout the awards ceremony. I have not yet heard of which other events have applied for UWCT status. Any information welcome. 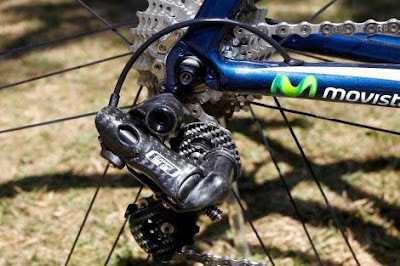 The concept of the UCI's involvement in gran fondo/sportive type events is interesting. The Marche region is located in the central area of the country, bordering Emilia-Romagna and the Republic of San Marino to the north, Tuscany to the north-west, Umbria to the west, Abruzzo and Lazio to the south and the Adriatic Sea to the east. Some of the most enjoyable, and beautiful, riding I've done in Italy has be in Marche. "The goal is to move cyclists towards finding the true love of cycling that is above all a challenge to oneself, and not the exaggerated competition we are witnessing today. The Gran Fondo event, over time, has increasingly taken on an elitist dimension. Increasingly, attention has been given to the order of arrival and the riders (always the same) who are fighting to win. For real amateurs a victory is more and more unattainable. They are relegated to a mere outline of the event story, a number to be shown in the final report. 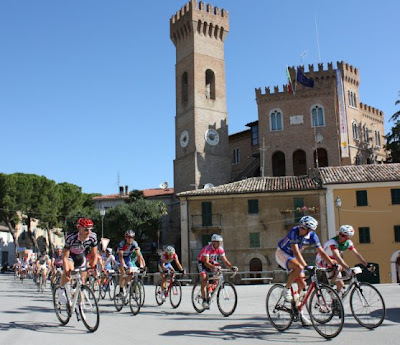 The Marche in Bici circuit hopes to rediscover the adventurous spirit that animated the first gran fondo events when the challenge for those that rode was, first, with oneself. It is in this spirit that Marche in Bici has decided to revolutionize the concept of ranking in a Gran Fondo by designing a new ranking system that in a few years will prevail on the order of arrival: the "Performance Personale". A classification designed to reward the rider who will be more improved than the previous year. The winner will be decided based on who was stronger against himself. Theerfore, in the future there will be two classifications in each of the medio (medium) and lungo (long) results. The "Performance Personale" victors will receive the same prominence as those in the order of arrival classification. The idea is to give prominence to the human spirit, to the challenge that every cyclist undertakes against himself." Note: my translation of the organizer's announcement was not word for word but it does capture the sentiment of the goal that is trying to be achieved. 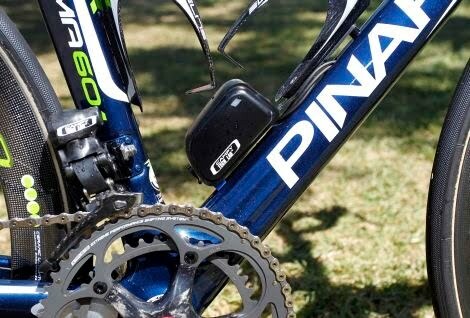 These changes, and those of the La Pinarello (see Direction Change for Granfondo Events? ), reflect a growing sense that gran fondo events have steered too far from their origins. For the first time a field limit will be implemented at L'Eroica this year. The possibility of this was aired in November when the organizer stated, "This event has now reached the perfect size, therefore the number of participants ideally should not exceed that of 2010. This seems to us to be the best way to guarantee the top quality service that we want to ensure into the future. We intend to use our website to offer both Italians and foreigners the opportunity to register their participation but we will certainly provide the same opportunity to those who are not computer literate." In 2010 there were 3,480 riders with slightly more than 20% coming from outside of Italy and representing five continents. 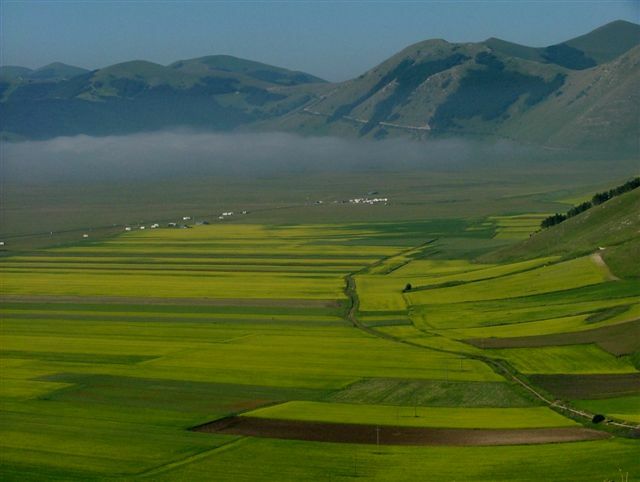 For 2011 the field limit has been defined as permitting 2,200 Italians and 500 from other nations between the ages of 15 and 60 years old. Participants born before December 31, 1951 (over 60 years old), whether Italian or foreigners, are exempt from these field limit numbers but must formally register through the various means the organizer provides. Also, riders over 65 will be permitted to ride only the 38, 75 and 135 km courses; that is, they will not be permitted to ride the longest course of 205 km. Stage IV for Javier's primarily off-road journey is a two day stage taking place in the Brenta Group and the Val di Sole. Javier begins in Don and finishes at the Refugio Lago Corvo. The Brenta Group (Dolomiti di Brenta in Italian) is a Dolomite mountain range located in the province of Trento. The Brenta Group is the only dolomitic group west of Adige River. It is separated from the Ortler Alps in the north by the Noce valley; from the Adamello-Presanella group in the west by the Campo Carlo Magno Pass and the river Sarca; from the Fiemme Alps in the east by the Adige valley. Like the Brenta Group, The Val di Sole (or Valle di Sole) is located in the province of Trento. The valley name of Val di Sole applies to the Val Vermiglio, the east-west aligned valley of the river Noce and its side valleys, among which the Val di Peio that heads to the Ortler. The rest of the valley from Ossana to Mostizzolo is simpy called Val di Sole. Some of the towns in the valley are Vermiglio, Peio, Dimaro, Croviana and Malè (the main town). Of the second day, "A hard but tranquil day, especially after yesterday. A long descent by trail to Dimaro was great fun. Then, the descent continued by road to Male all of which made the stage easier. 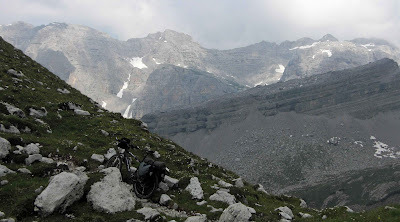 The main difficulties we would find at the end of the long climb to the Refugio Lago Corvo. After a few Kms of road and trail riding the last part of the trail brought renewed walking and pushing of my bike for 2.2 km, much shorter and easier than the Passo del Grosté from yesterday." RATIO is a small Italian component design company that was begun by Pancrazio Centola who previously worked for 3T and Deda. New to the product line is fleece handlebar tape. Will it keep your hands warmer? They do claim that it is very, very good at isolating vibrations. Columbus has re-introduced Max and Minimax tubesets using modern metallurgy. By the way, I also have a small blog, named "Columbus MAX Bikes", where I have been collecting photos of Max, MXL (Max for Eddy Merckx), and Minimax bikes . Why? Because they are great steel bikes and the ovalized tubes make it interesting. This story courtesy of CINELLI (Gruppo S.r.l.). 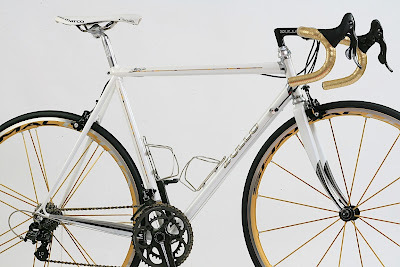 In 1992 the Cinelli Hyperion appeared in the Cinelli catalog. This was to be the Laser of the future. 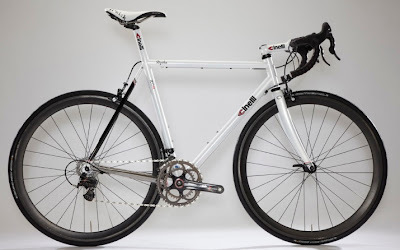 The Cinelli Hyperion was a sophisticated experiment in the development of the use of sheets of 3-2.5 titanium grade that would be molded around the tubeset joints and then welded. The goal was to reach a level of rigidity that could compete with steel with a weight saving that would not be insignificant. 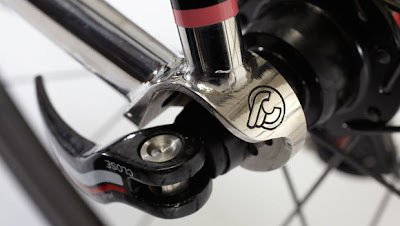 These methods led to the development of the legendary Cinelli Grammo stem (110g in 1992!). "When Cinelli introduces a new material or a new construction technique the product is reviewed and redesigned to take advantage of the new possibilities offered, and in complete freedom. Thus, the Laser has an image of a very special bicycle, 'rationalized' for performance while at the same time being faithful to the fundamental lines of the frame but but re-proposed in a more clear and focused form." It's probably best that I don't comment about how this all came about....perhaps, it's best to just say it was inescapable. 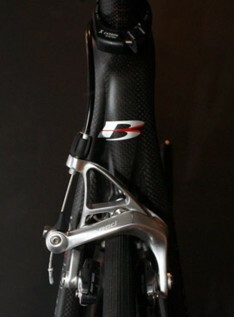 Photos courtesy of Road Bike Action magazine that is running a series on the new pro bikes for the 2011 season. Guest contributor John, from the U.S., writes in with his story about a part of his trip with Eros Poli, the first Italian to win a Mont Ventoux stage in the Tour de France. "My wife Eileen thought I was out of my mind, signing up for a cycling trip to the French Alps and Italy at the same time my son and his wife were going to have their second baby. We were all hoping for a little girl, since the first 4 grandchildren were boys. I assured her that cell phones work in France and Italy, just as well as they do in America. So with the assurance that I would keep my cell phone with me at all times and not ride off a mountain top somewhere, she gave me her blessing to embark on a trip that I will vividly remember the rest of my life. It was, literally, one long series of “Oh my God” moments from the time we arrived in Geneva and met our guide Eros Poli and his assistant Ivan, to the last day in Verona, Italy having dinner with Eileen, trip mate Brent, Eros and Ivan on the balcony of Eros’ apartment. This story is about day 3 of that epic trip to some of the most famous mountain routes of the Tour de France, including the Col du Telegraph and the Col du Galibier. Day three, Monday, was a rest day for the 2010 Tour de France. We left our hotel in Evian les Bain on Lake Geneva, and drove in our van to Morzine, the scene of the previous day’s mountain top stage that ended in nearby Avoriaz. We spent the morning walking amongst the team equipment trucks and team buses, taking pictures and enjoying the proximity to the riders and their very exotic and expensive equipment. We then drove several hours to St. Jean du Mauriene, France to begin our ride for the day up Col du Telegraph and Col du Galibier. Since we were starting in the late afternoon, and my son’s wife was scheduled for a C-section delivery at about 10:30 AM in New Jersey, I figured we would hear something by way of a text message sometime after 4:30 PM in France. We left St. Jean du Mauriene at about 4:00 PM. The first few km’s were relatively flat and wind through the village streets, cross a bridge and quickly start the long, steady (about 7 or 8%) grade up the Col du Telegraph. From the village to the Col, is about 12 km’s. Each kilometer is marked by distinctive yellow markers counting down the distance to the top of the climb. I had my Blackberry in my jersey pocket with the ring tone set to a very distinctive “ding dong, ding dong” whenever a text message is received. Trip mates Brent and Diana were stronger and had gone ahead up the mountain. Joe, Kimberly, and I were bringing up the rear along with Eros on his bike and Ivan driving our van. Part way up the mountain, we could look back on St. Jean du Mauriene and watch the afternoon thunder showers in the valley below. It was a hot day and a shower would have been welcome, but we stayed clear of the showers. At almost precisely 4:45 PM at about the 5 km marker, my Blackberry rang its distinctive alarm that meant I had received a text message. Kimberly, riding close behind me, heard the alarm as well. I wanted desperately to stop and check the message, knowing it could be only one thing. Along this stretch of road there was very little shoulder with a stone wall next to the road which gave me little room by the roadside to stop. After perhaps a couple hundred meters looking for some room I gave up trying and stopped. By the time Kimberly and Eros arrived I had managed to extract the phone, hit the right button (hands were shaking) and was able to make out a message (didn’t have my reading glasses) from my son in the delivery room that baby girl Amina had been born at 10:40 AM. Mom and baby were doing fine. Everyone had expected a boy, so this little girl was a totally unexpected surprise. The three of us stood there by the side of the road, my hands shaking and in tears, trying to respond to the message. Eros chronicled the event on his camera with pictures of the cell phone and my trying to respond without my glasses and shaking from the excitement of the moment. We finally got ourselves together, made it to top of the Col du Telegraph, took some pictures and headed down a short descent to the ski station of Valloire. From the center of the village of Valloire to the top of the Col du Galibier is about 19 kms at 7% – 9%. It is a stunningly beautiful route amongst the tall peaks of the Alps. In mid July, snow remains in the high peaks and shaded spots along the route. The sun was low in the sky giving an even more beautiful caste to the mountains and clouds. After about 2 ½ hours of steady climbing we arrived at the top of the Col du Galibier. Our van was waiting for us, the sun was setting behind the mountains and it was getting quite a bit cooler as the day wound down for us. I literally felt like I was on top of the world. A little girl, born that afternoon in New Jersey, had given me a push up that mountain unlike any experience of my life. We took our pictures, got in the van and watched as Eros got on his bike and headed down the backside of Galibier with us trailing behind. We quickly fell back as Eros reverted back to his professional cycling days with a descent that had all of us holding our breath. The high mountain roads have no shoulders and no guardrails, so any mistake or misjudgment would have sent him into the abyss. He was in his element and truly enjoyed the ride down the mountain. We arrived at our hotel in the ski station of Monetier, and were met by Eros’ good friend and hotel owner Colette on the evening before Bastille Day. That night, we celebrated an amazing day in the mountains and the birth of my fifth grandchild with Prosecco wine and dinner followed by Colette’s special meringue, whipped cream, fruit and ice cream desert. A dinner with Eros invariably ends with Espresso and Limoncello. It was 11:00 PM as we finished. At midnight, while Bastille Day fireworks went off outside, we finally were able to connect, via Skype, back to the US for a quick view of baby Amina and her proud 3 year old brother. Altogether, a memorable day of cycling and celebrating that I will cherish forever. Thanks to Eros, Ivan, Collette and the rest of our group for a trip and a day of a lifetime." My thanks to Albabici for sending in a box full of prizes for the in progress reader contribution contest. The items include LIMAR sunglasses, SCI'CON saddlebags, and Team Liquigas and Francaise Des Jeux skull caps (for summer). 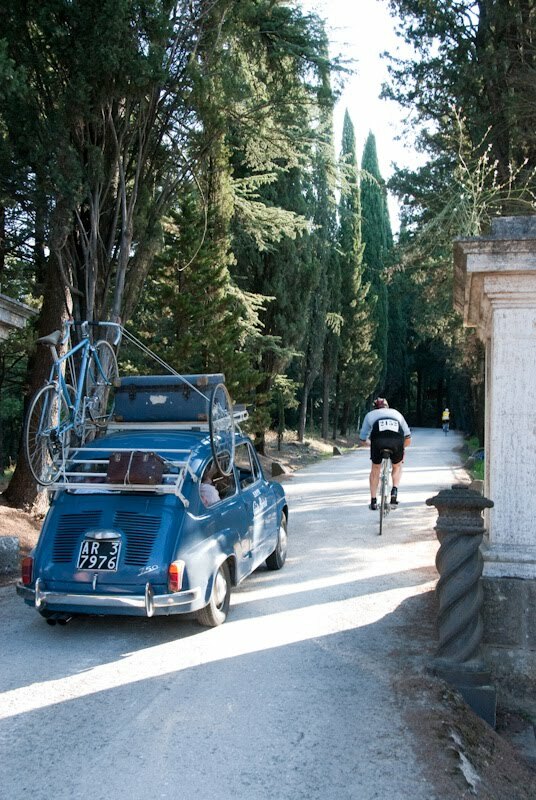 About the reader contribution contest: Write a story about your cycling trip, or an aspect of your trip, in Italy. Or, it can be about a granfondo experience, a special encounter, your favorite ride, etc. The period for story submissions ends February 15, 2011. Share your story. Photos accompanying the story are most welcome. Prizes will be awarded on a random basis, stories will not be judged on which is the "best" one. Nevertheless, it should be a good story for the enjoyment of all readers. If you have any questions email me at veronaman@gmail.com. See photos of prizes here. The choice of the Criterium racer. Fabricated with oversized Columbus XCR stainless tubing, this bicycle is made for diving fearlessly into corners. 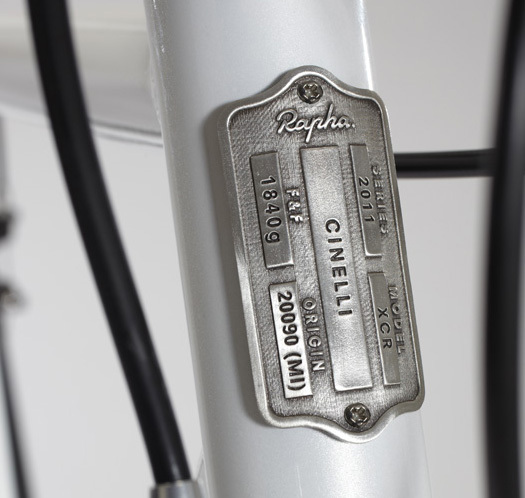 Cinelli has been a leader in bicycle design since 1948. Sitting only 10 miles outside of Milan, it stands to reason that design and art also influence Cinelli products. Cinelli is a brand where competition, history, passion and performance have long melded to bring beauty to the sport of cycling. In an adjacent factory, Columbus Steel is a close compatriot to Cinelli. Columbus began making bicycle tubing in 1919 and has a decorated heritage of powering the likes of Coppi, Merckx, Pantani, Armstrong and countless others. 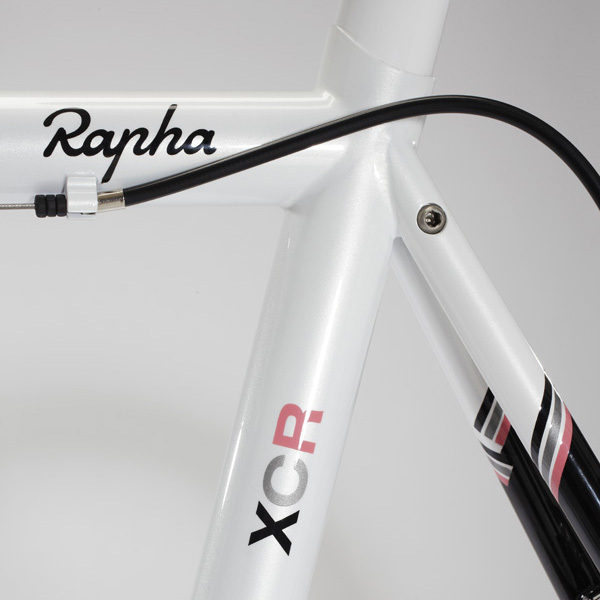 For this collaboration, the seamless Columbus XCR stainless steel tube-sets are literally passing across the factory floor to Cinelli to make the Rapha Criterium Racer. With geometry specified by generations of building for the strongest, fastest and most fearless in the sport, this frame and fork are intended for the aggressive racer. The Columbus XCR tube material exceeds anything in the market for technological quality and has a higher stiffness to weight ratio than titanium or aluminium, delivering great feel and total confidence at high speeds. Painted Pearl White, except for a polished reveal of the beautiful stainless, and with pink, black and grey race bands, the Criterium Racer marries tradition and performance. The Rapha & Cinelli XCR is limited to only 30 frames/fork per year because of the scarcity of the material. 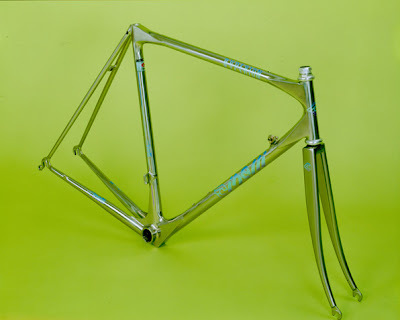 Delivery of your frame/fork is estimated for 4-months from time of order. 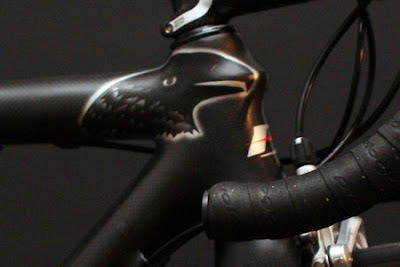 Cinelli will take orders direct, go to www.cinelli.it to buy your XCR Criterium Racer. Price: Frame/fork starting @ €3,500 + shipping; please note: Prices do not include import tax and duty which will vary by country. In stage III of his journey Javier passes through the wonderous Dolomites over four days beginning in Casera Melin and finishing in Don, southwest of Bolzano. His route takes him through major parks: Parco Nazionale delle Dolomiti Bellunesi, Naturpark Fanes-Sennes-Prags, Parco Naturale Regionale delle Dolomiti d'Ampezzo,and Parco Naturale Provinciale dell' Adamello-Brenta. The name "Dolomites" is derived from the famous French mineralogist Déodat Gratet de Dolomieu who was the first to describe the rock, dolomite, a type of carbonate rock which is responsible for the characteristic shapes and color of these mountains; previously they were called the "pale mountains," and it was only in the early 19th century that the name was Gallicized. On the 3rd day of this stage (9th day of trip) Javier encounters riders participating in "Sella Ronda Bike Day", a day every year when the roads around the Sella Ronda are closed to traffic and open to cyclists. See information about Sella Ronda Bike Day here. Of these days in the Dolomites Javier writes, "A must for any fan of mountain biking if you want to know the Dolomites." The ASO (Amaury Sport Organization) has announced, rather early, the 22 teams for the 2011 Tour de France that will begin on July 2nd. Eighteen of the teams are "ProTeam" squads which according to UCI rules must be invited. The four remaining wild card slots were given to French teams. Italian team Geox-TMC must be deflated. They had a small glimmer of hope for an invitation. That will leave Carlos Sastre, winner of the TdF in 2008, and Denis Menchov who finished 3rd last year, out of the race. 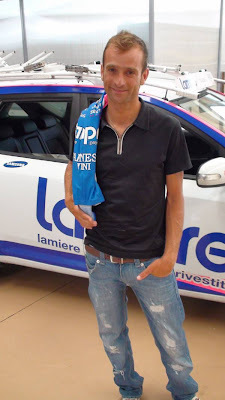 In mid-December Michele Scarponi, now with Lampre-ISD, started his 2011 Giro d'Italia preparations with a reconnaissance of the 9th stage from Messina to Etna, concluding with a finish at the top of the volcano. paid close attention to the two climbs that will characterize the course: the Mottarone and the final climb to Macugnaga. Scarponi's observations after the reconnaissance, "First of all, it's necessary to consider that the stage will be scheduled in the final part of Giro d'Italia when all the riders will be low on energy and the top classification riders will be willing to try their last chances for the pink jersey. I think that it will be a tough stage, it will be important to manage one energies in order to cover in the best way the 3000 meters of difference in altitude. Mottarone is a climb for pure climbers and the Macugnaga one is very long, more or less 28 km, and complicated because it requires many changes of pace." The race will be 190 km in length, beginning Gaiole in Chianti and finishing at the Piazza del Campo in Siena. The route will have 8 sections of "white roads" totaling 57 km of the 190 km route; the longest white road section is 13.5km. 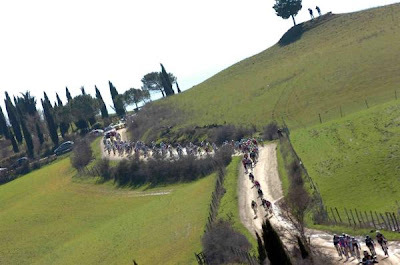 The "Strade Bianchi" road race was created by RCS Sports in 2007 to establish a one day "classic" type of pro race in Italy in the early season. "Hand made from Nappa leather with a snug cotton fleece lining, classically styled, and beautiful to the touch. Featuring slim palm padding and side zip opening with leather puller, providing excellent comfort and control. 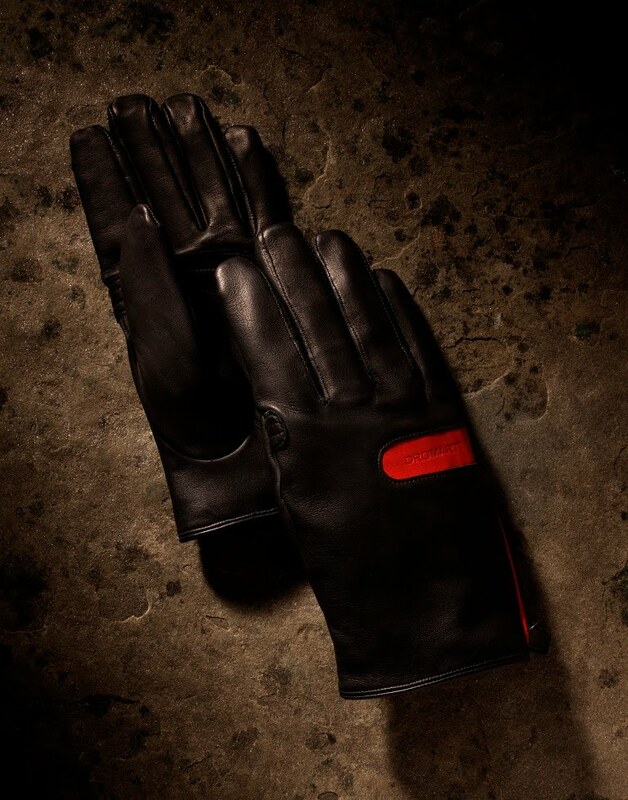 The contrasting red leather detailing perfectly complements the black leather to produce a stylish and practical glove that can be comfortably used both on and off the bike. A must for the serious cyclist. Available now - £120/ $160"
Additional photos, and order information, here.